Melanie Klein has been one of the most important contributors to our thinking about human development and human personality. 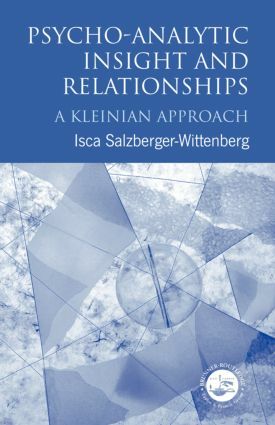 In this classic text, Isca Salzberger-Wittenberg demonstates through theoretical exposition and the use of case material the ways in which Melanie Klein's main concepts and theories illuminate the practice of social casework. These theories are often complex and controversial, but this concise and lucid account continues to enable social workers and others in helping professions to judge the relevance of the Kleinian approach for themselves. Acknowledgements. Introduction. Part I: Aspects of a Relationship. Feelings the Caseworker Brings to the Relationship with the Client. Feelings the Client Brings to the Relationship. Transference and Counter-transference. Phantasy. Love, Hate and Conflict. Interaction. Part II: Conflict Anxieties and Defences. Persecutary Anxieties and Defences Against Them in the Adult, Child and Infant. Depressive Anxieties and Defences Against them in Adult, Child and Infant. Anxieties Related to Loss and Mourning. Admiration and Envy. Part III: Gaining Insight and Applying it in the Casework Relationship. Gaining Insight. Therapeutic Interaction. Some Thoughts on the Responsibility and Burden of Casework. Suggestions for Further Reading. Bibliography. Isca Salzberger-Wittenberg is a top psychotherapist in the Adolescent Department of the Tavistock Clinic, London. Her background is in university teaching, and she is organising tutor of an evening course for teachers.